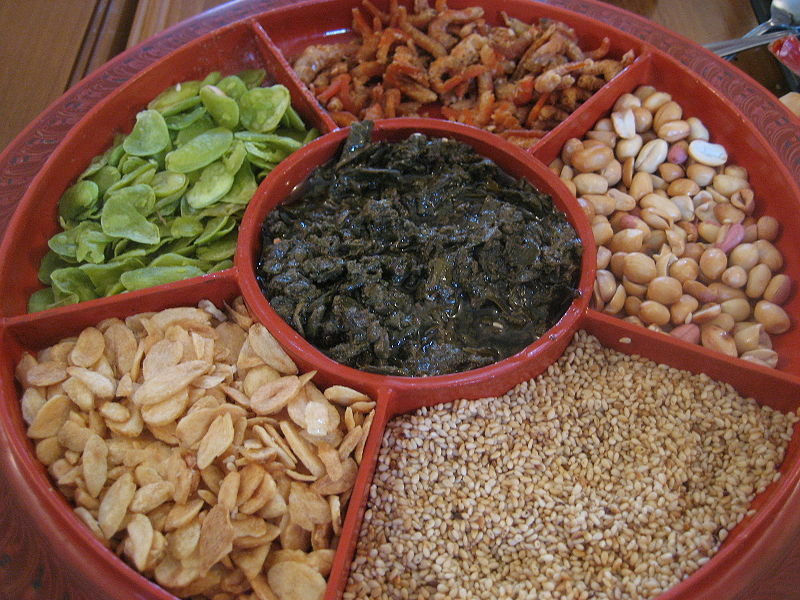 Lahpet is Burmese for fermented or pickled tea. Myanmar, formerly Burma, is one of very few countries where tea is eaten as well as drunk. 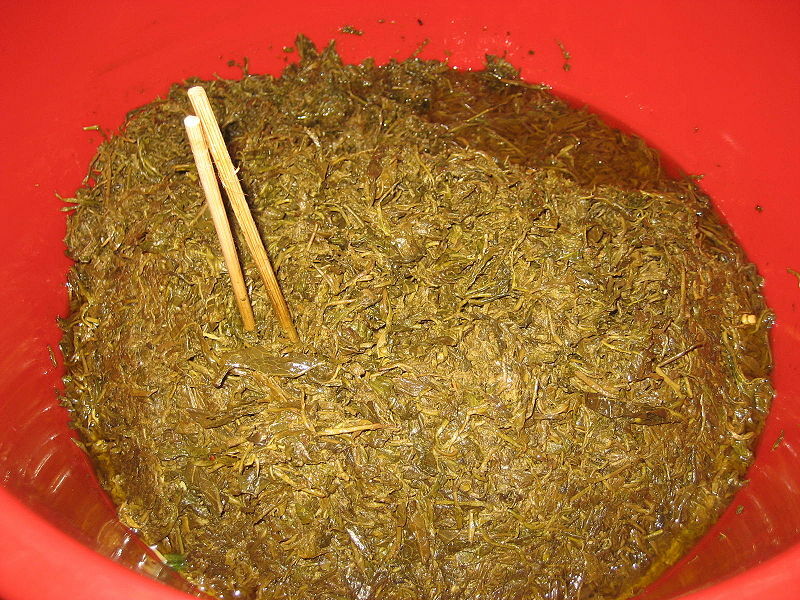 Its pickled tea is unique in the region, and is regarded as the national delicacy. Left: Lahpet sold at a market in Mandalay, Myanmar. Left: Lahpet is served traditionally in a shallow lacquerware dish called lahpet ohk with a lid and divided into compartments - pickled tea is laced with sesame oil in a central compartment surrounded, in their own compartments, by other ingredients namely crisp fried garlic, peas and peanuts, toasted sesame, crushed dried shrimp, preserved shredded ginger and fried shredded coconut. It may be served as a snack or after a meal holding centre stage on table with green tea; it may be just for the family and visitors. Apart from its bittersweet and pungent taste and leafy texture, many also believe in its medicinal properties as beneficial for the digestive system. Its stimulant effect to ward off tiredness and sleepiness is especially popular with students preparing for exams. Left: Lahpet thohk or Yangon lahpet is pickled tea salad which is very popular all over Myanmar. 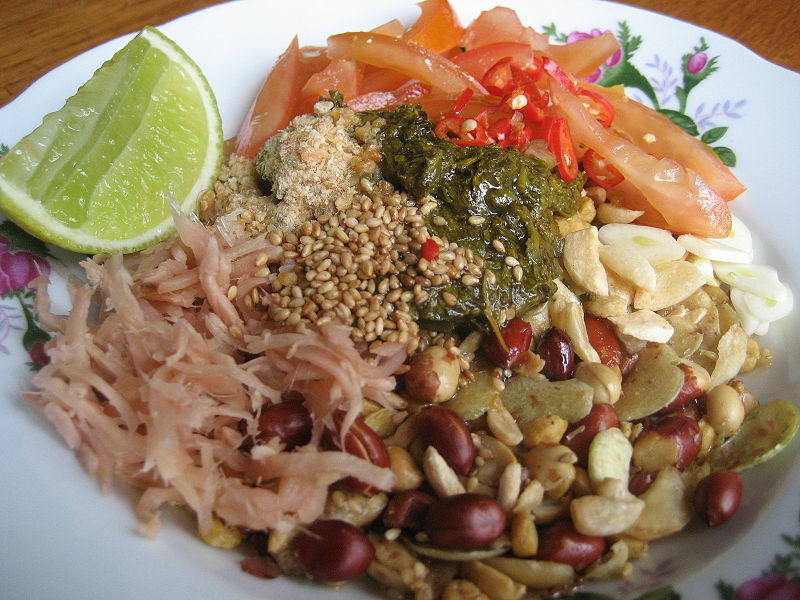 It is prepared by mixing all the above ingredients without the coconut but in addition includes fresh tomatoes, garlic and green chilli, sometimes shredded cabbage, and is dressed with fish sauce, sesame or peanut oil, and a squeeze of lime. Many would have lahpet together with plain white rice, again a student favourite.